Naviator™ Reno - Automatic - STØLÅS Watch Co.
Click the button below to add the Naviator™ Reno - Automatic to your wish list. Due to unforseen delays on the Naviator collection, pre-order is not currently availible. The Naviator™ is the latest collection from STØLÅS. In order to maintain the Maritime image of STØLÅS we used our in-house designed Harbormaster™ case with it’s stainless steel fittings paired with a new “port hole” style bezel. The 12‘o’clock screw is colored for easy reference giving the user quick adjustments as necessary. The Naviator™ continues with the skeleton hands but fills them offset to allow true at-a-glance readings regardless of hand position. The stainless steel case is brushed finished and PVD versions are matte black. The port hole bezel features a unique cable grip signifiing the imporance of the landing grab cable to catch naval aircraft on carriers. Automatic Naviator™ series hold true through the G’s and use a more refinedmechanical engine. Sandwich dials and extreme easy-to-read interfaceaids in the aviators “seam of his pants” decisions. Solid case backs and sapphire crystals up front makes the autos a top choice for professional pilots. The Reno signifies air racing. With darkend (rustic) racing stripes and a instrument panel squared sub second dial gives this models wearer the "Need for Speed". Pre-Order priceing will increase at regular monthly intervals so dont delay and get your new Naviator™ ordered now and Call The Ball! $200 down payment is required for Pre-Order purchase. 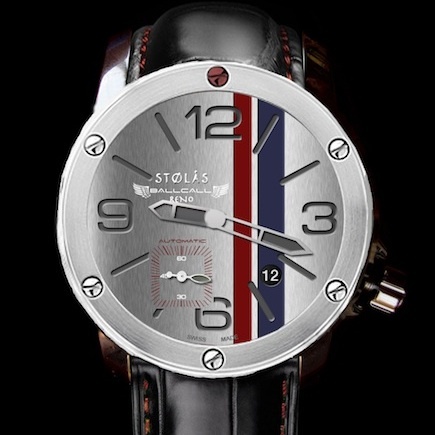 All STØLÅS Naviator™ Models carry a two year limited warranty. Please view the "Watch Manuals" page to view the full warranty.